Killy, a silent loner possessing an incredibly powerful weapon known as a Gravitational Beam Emitter, wanders a vast technological world known as "The City". He is searching for Net Terminal Genes, a (possibly) extinct genetic marker that allows humans to access the "Netsphere", a sort of computerized control network for The City. The City is an immense volume of artificial structure, separated into massive "floors" by nearly-impenetrable barriers known as "Megastructure". The City is inhabited by scattered human and transhuman tribes as well as hostile cyborgs known as Silicon Creatures. The Net Terminal Genes appear to be the key to halting the unhindered, chaotic expansion of the Megastructure, as well as a way of stopping the murderous horde known as the Safeguard from destroying all humanity. Along the way, Killy meets and joins forces with a resourceful engineer named Cibo and several groups such as a tribe of human warriors called the Electro-Fishers. Cibo and Killy are often pursued by the Safeguard, who view any human without Net Terminal Genes as a threat to be extinguished on sight. . I saw the movie a couple of nights ago, and I was very, very impressed. 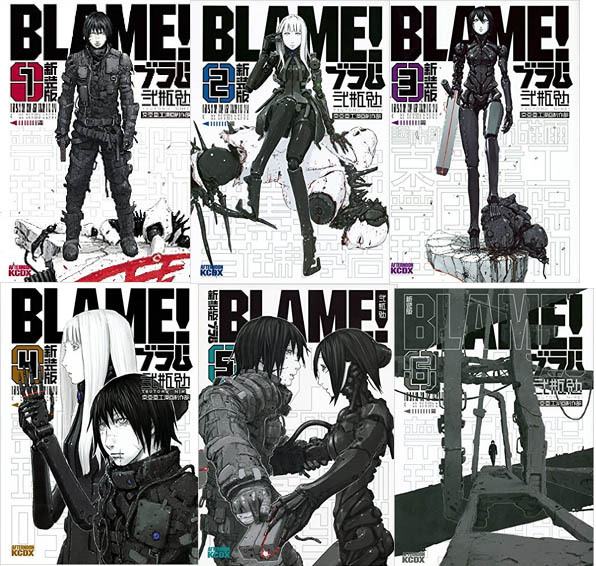 I don't think too highly of the use of 3D models in anime, but I was completely blown away by BLAME!, it was absolutely solid. It's easily persuaded me to read the manga, so I'll be hopping on to that soon. Yeah, I saw this appear on Netflix. It looks very interesting, I haven't watch anything anime in awhile so I may watch it. I really recommend reading the manga. The film did not do justice to the gigantic size of the city. It also changed some small things here and there about the story arc it covered, which I think flowed a bit better in the manga. You also might be surprised at first, but there is less dialogue in the manga than the anime might make you think and it focuses more in KillyÂ´s and CiboÂ´s travelling, but it works pretty well. Overall the atmosphere is very depressing in the original work, and it`s very bloody and brutal. I am curious to hear you`r thoughts about it when you start reading it. I have also planned re-reading some of the volumes. I`m currently reading Nihei`s another work called Knights of Sidonia, but I am still at the early chapters so I canÂ´t really comment on it. I recommend it! While I think it`s not as good as the original work, the movie still is very entertaining and has an unique feeling in it.